Tobias Harris may be just two games into his Philadelphia 76ers tenure, but he’s already showing off his playmaking ability alongside Ben Simmons, Joel Embiid, and Jimmy Butler. Although Harris was just acquired by the Sixers at the NBA trade deadline, he’s already making his presence felt as the fourth star in Philly’s starting lineup. The first Tobias Harris Sixers merch has dropped, and his branded replica jersey is available online for adult and youth sizes at Fanatics, NBAStore.com, and the Sixers Shop. 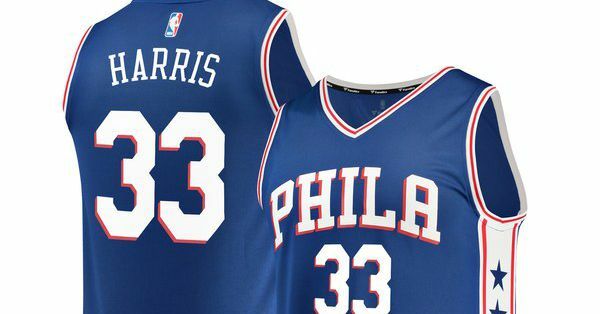 Note: We’ve been told that Nike will not release a Harris Sixers Swingman jersey this season, but you can create one with a customized jersey. In his first two games as a Sixer, Harris has made a seamless transition into Philly’s starting lineup. In two games, Harris is 5-for-8 from three and grabbed at least six rebounds in each contest. Most importantly, the Sixers are 2-0 with their newly acquired star, and hoping to head into All-Star Weekend with wins against the Celtics and Knicks this week. Check out the T-shirt and hoodie that have dropped. Joel Embiid’s monster season has earned him a starting spot on Team Giannis in Sunday’s All-Star Game in Charlotte. If you’re interested in picking up some All-Star merch to celebrate the weekend, here’s the Embiid jerseys you can order online, too. With All-Star Weekend kicking off on Friday, we’ll keep you updated as more merch and apparel drop over the next few days.